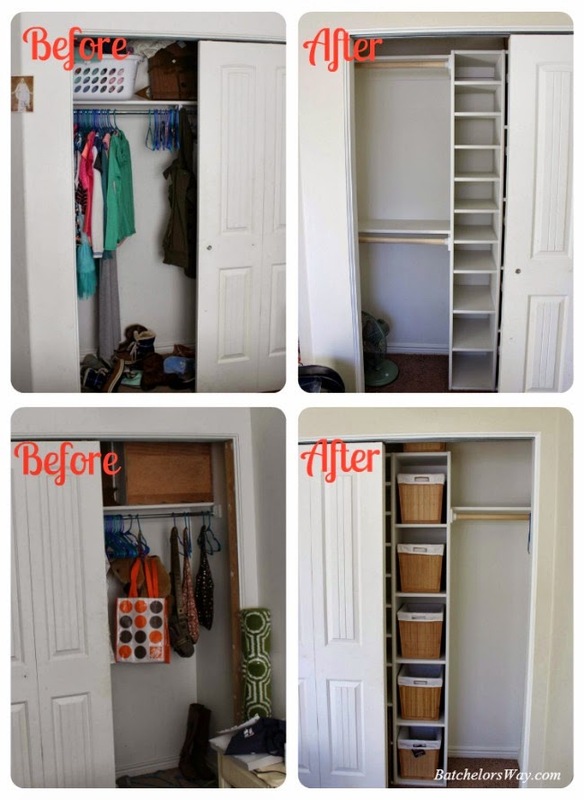 The first project I tackled in Ash's room was the closet. You know how I feel about a single closet rod! So I ripped it out and made a custom closet. Double hanging and shoe cubbies on one side; long hanging space and basket storage on the other side. Ashlee's closet was bigger than Emilee's so her baskets for underwear, socks, etc... are inside her closet. I built it just like I did Em's closet here, only the shoe and basket tower were built as one unit. I built it on the kitchen floor and thought I would just move it into the bedroom when done. This thing was freaking heavy!!! Luckily I have a super awesome sister who came over and helped me move it. I didn't put any ledgers or braces in the back of the cubbies to help keep the unit square, and I had run out of nails in the nail gun for the last two shelves and didn't know it. Needless to say, it almost fell apart during the move down the long hallway. When we got it into her room we had to lean it up against the wall and hold it so it wouldn't fall over. But I used a rubber mallet and put it all back together and added four braces. it was super strong and ready to install. When my awesome hubby got home from work and helped me do just that!! 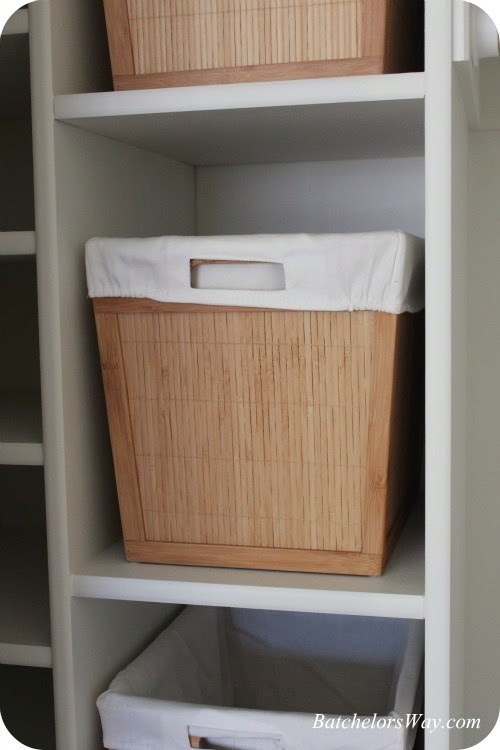 I actually went shopping for baskets or bins before I built this, so I could build it to fit the baskets. I happened to be at Lowe's checking out what they had available when I saw these awesome bamboo fabric lined boxes on clearance for $2.60 each!!! 6 in total costing $16 for them all!!! They were originally $19 each!!! That's a savings of $104!!! I may paint or stain them, we will see. But for now I just love how sturdy they are! OK enough about my awesome deal!! After the closet was done I put Ashlee to work helping me fill all the millions of pin holes in the walls. Then we sanded them, and primed the entire room!! She is actually a really good worker. She pays attention to detail, just like her mama!! Well next I am onto the built-ins! !